Decided late, actually just on the last day of registration to participate in the brevet along the Bangalore-Chintamani-Kolar-Chintamani route. Somehow managed to get the registration completed just a day before the event. Reached Bangalore on Friday, and was pretty confident to do well with the mileage put in on the bike over 3 weeks in Mumbai. For the uninitiated, a brevet is a long distance self-supported ride to be completed within a specific time. I was to do a 200 km ride within 13.5 hours. All started off well, with me feeling fresh on the morning of the ride. Pedalled from the Airlines Hotel with around 75 other cyclists and was going at a pretty decent pace until disaster struck at the 15 km mark. A flat tyre. A fellow cyclist stopped by and helped me change the tube quickly. Within minutes of getting back on the bike, I realised I had a flat again. Realised my folly then. I had used an old tube instead of the new one I had got just the other day. Got off the bike, and fixed the new tube, making doubly sure of everything this time. I had lost close to an hour within this double change, thanks to my oversight. The way to the BIAL airport though was familiar territory and I pushed it as much as I could. Reached the check points well within the stipulated time, though the lost time meant I had to skip breakfast and make do with the snack bars I had carried. Everything went fine thereon. I caught up with Ranga and Vinod at the first check point and we were very much within touching distance for most of the time until the second check point. I was fairly pleased at having recovered lost time, and had a quick meal after the last check point. Vinod and I were together at this point, and we estimated we would finish the ride at 6.30 pm, 30 minutes before the cutoff point. The ride thereon was a smooth one. Hit the Bangalore-Tirupati highway with around 60 km to go. The route was more or less flat which meant I could go flat out to reduce the margin – 30 minutes did not look like a comfortable cushion at that point. With around 2 hours to go, I had another 35 km left, and was confident of finishing on time unless another flat tyre reared its head. And that is exactly what happened, as if I had invited it with some psychic powers. This time I had to fix the puncture as well. 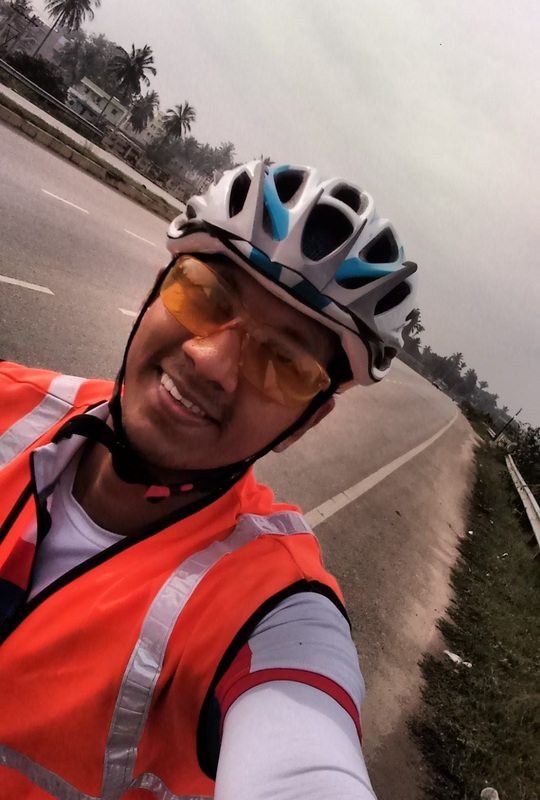 No bike repair shop in sight, stopped at a two-wheeler mechanic, and managed to fix the puncture using the glueless patches – the first time I was using them. Got back on the bike, and with a few kilometres, realized the patch was not fixed well enough. Got off, fixed a new patch, this time even taking the help of a reluctant mechanic who double-checked the tube for any other punctures. Double-checked the tyre to ensure it was not pierced by a nail or spike, and carried on. This patch-fixing business had taken off another chunk of time, and I had 30 km to go with 45 minutes left. Knew it was practically impossible, so focussed on completing the ride by 7.30 pm. It was thereafter just a matter of keeping my sight on the finish line, and persevering till the end. The tyre gave way again some 10 km before the finish, I was way too drained to fix it myself or look around for a puncture repair place. Dragged on for the rest of the ride, finishing at 8 pm, proud to have been mentally strong to never give up in spite of the obstacles, disappointed not to have made the cut. Physically, my body handled the distance well, and felt refreshed after a scrumptious dinner, so that’s another thing to feel good about. Lesson learnt: Need to figure out a way to avoid punctures, or else, fix them more efficiently. Guess that would come with practice, so I have a couple of sessions under my belt already now. Just make sure you keep a couple of tubes always though. While I’ve never ridden the distances you have, the tiny extra weight seems like a small price to pay. Also, another thing a lot of bikers here do, is compulsorily tune their bikes up (professionally) before a long ride. Yea, did ride on the flat tyre for a few kms. Not recommended, but the state I was in, I was not making smart decisions. This is quite common if you haven’t filled enough air in the tube. Around 120 psi for road tyres and 50 for mtb tyres. Thank you, Raison. Yes, pinch flats could have been a reason too. I was inexperienced in fixing punctures then. I switched to Gatorskin Continental tyres after this event and had very few punctures in the next two years.